The Quiet Walkways of Great Smoky Mountains National Park are short and relatively easy trails that lead directly from the road and plunge quickly into selected areas of natural beauty. They offer a peaceful and rewarding experience, and some of them are easy enough for any non-hiker to take a walk in the woods. There are around 14 of these special trails in the park, and each one is unique. They’re scattered throughout the park, but several of them can be found along Highway 441 and Little River Road. The Quiet Walkways are a great way to see some of the distinctive beauty of Great Smoky Mountains National Park up close, whether or not you’re an experienced hiker. You don’t need a backpack or hiking boots to explore these hidden gems (although sturdy footwear is always a good idea), but what you do need is to spot the signs. These trails are marked by inconspicuous signposts labeled “Quiet Walkway” that direct you to turn off the main road at various spots. They’re easy to miss., and many people drive right by. Typically you’ll find a small parking area big enough for one or two cars to pull off the road. This is your trailhead. From here, you quickly immerse into a deep and quiet part of the park, often quite alone. Most of the Quiet Walkways are approximately 1/4-mile to 1/2 mile in length, and they are designed to be easy enough for anyone who can walk on a trail. They serve equally well as a way to stretch your legs and take a break from driving, and as a destination in their own right. If you’re looking for a peaceful day trip from your Smoky Mountains cabin, consider taking a drive that includes checking out one or more of the Quiet Walkways. They are perhaps the most charming and gentle way to get a taste for hiking the park, and may easily lead to trying some longer trails over time. The Quiet Walkways of Great Smoky Mountains National Park are the unsung heroes for those who are looking for a more accessible trail experience, and they prove that humble doesn’t have to mean boring. Here are some Quiet Walkways to get you started, but there are several more worth exploring. 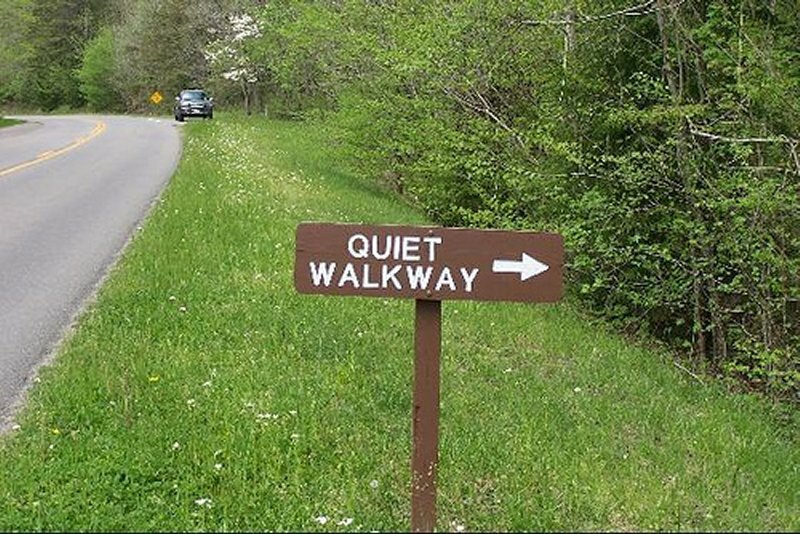 On several of the roads that wind between Sugarlands Visitor Center and Cades Cove on the Tennessee side of the park, you’ll find serene Quiet Walkways that you can explore at your leisure. Most of the walkways in this region are located off of either Little River Road or Laurel Creek Road, although there are a couple of others in various spots. The area between the Sugarlands Visitor Center and Cades Cove on the western end of the park is where you will find several of the quiet walkways. As you drive west from Sugarlands on Fighting Creek Gap Road, the second walkway you come upon will be the Hickory Flats Quiet Walkway. This path takes you near a small creek known as Hickory Flats Branch, which is one of the main routes for water to drain down off of Cove Mountain. It also crosses over Whistlepig Branch as well. The trail is listed as being 0.3 miles one-way in length, and it is over non-strenuous terrain. Afterwards, if you drive a little further west on Fighting Creek Gap Road you will see the Laurel Falls Quiet Walkway. This 0.3-mile loop will allow you to see some of the terrain around the Laurel Falls area without having to hike the more strenuous and time-consuming Laurel Falls Trail. Both of these quiet walkways are easy drives from the town of Gatlinburg or the Sugarlands Visitor Center. This highway cuts all the way through the middle of the Great Smoky Mountains National Park, and you can stop at several of the Quiet Walkways on it even if you’re just driving through. You can find four of them on the Tennessee side of the highway, between the Sugarlands Visitor Center and Newfound Gap, which is near the Tennessee – North Carolina border. An additional five are accessible between there and the Oconaluftee Visitor Center, on the way down to Cherokee, NC. Heading south from the Sugarlands Visitor Center on US Highway 441, towards the North Carolina border, you will discover several more quiet walkways. One is the Balsam Point Quiet Walkway, which is just a bit north of the popular Chimney Tops overlook. This path has an ample number of lined parking spaces, and it provides several close views of Steep Branch creek and the West Prong of the Little Pigeon River. This path is also approximately a 0.3-mile loop, and it features a clearing with a log bench where you can relax and enjoy the scenery. If you’re heading out west and you’re up for a longer walk, this trail is a great option. It is located near the town of Townsend, TN (in the Quiet Side of the Smoky Mountains), and it provides some beautiful river scenery. This walkway is 1.4 miles each way (2.8 mi. round trip), but it is suitable for all skill levels. It’s a longer trail, but it offers a good example of the flora of the national park’s backcountry without having to travel there. You can find the trail by heading south of Townsend on Tremont Road, and parking near the Middle Prong Trail trailhead. Then, keep to the right to reach the Thunderhead Prong Quiet Walkway.